“Today, the ghetto has become grist,” writes Mitchell Duneier in his new book, Ghetto: The Invention of a Place, the History of an Idea, a grist “for the most advanced experimental and statistical methods bent on measuring change in the short to medium term.” Duneier is not too concerned with the ‘short to medium term’; rather, he is interested in the long term, and the equally interested in the weight of the long past. 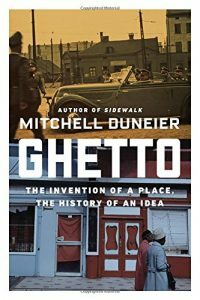 Duneier complicates the history of the American ghetto with ambiguity, conveying all the different histories that are built into today’s ideas of what a ghetto is, and thus reminding the reader of the historical diversity behind phrases such “segregated housing patterns,” “racial residential segregation,” and the word “ghetto” itself. In all its variations, though, Duneier outlines nine ways in which—both as a built space and explanatory concept—has contributed to the perpetuation of “restriction[s],” “prejudice,” “[control of black communities] by outside institutions,” and the “intergenerational phenomenon” of the ghetto as “as expression of a series of vicious cycles within the realms of education, work, family life, violence, and local politics.” Using Chicago and Harlem, but to a greater extent the four scholars operating within the two cities themselves, Duneier demonstrates that ghettos—or at least the normative conception of “the ghetto”—are not concrete, but in fact as multifaceted and dynamic as the communities they house. As social scientists and urban planners move forward in what might be called the “Century of Cities,” embarking, as they will, on projects of “renewal” and “regeneration,” remembering the rich histories of American ghettos might steady their hands as they take a seat at the drawing board, and perhaps, as Duneier delimits the concept of the ghetto, even lead them to realize the limits of social science. ­Ghetto: The Invention of a Place, the History of an Idea (New York: Farrar, Straus and Giroux, 2016), 228.